Construction Residential, Commercial, Restoration, Rehabilitation | BTS Builders, Inc.
BTS Builders, Inc. was established 25 years ago by Master Craftsman, Thomas R. McDonald. The company engages in both residential and commercial construction with a notable reputation for excellence in the area of historic restoration and rehabilitation. BTS Builders also produces selected custom projects for the marine interests in St. Augustine. Florida Trust for Historic Preservation Award for Non-residential Rehabilitation - Old St. Augustine Village, 2001. Florida Trust for Historic Preservation Award for Preservation Education/Media - Ximenez-Fatio House Museum, Visitor Center construction, 2004. Florida Trust for Historic Preservation Outstanding Achievement Award for Non-residential Restoration/Rehabilitation - Markland Cottage, Flagler College, 2008. 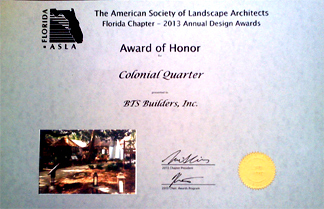 Florida Trust for Historic Preservation Master Craftsman Award - 2011.